↑ 4.0 4.1 Riehn 1991, p. 50. ↑ Zamoyski 2005, p. 536 — note this includes deaths of prisoners during captivity. 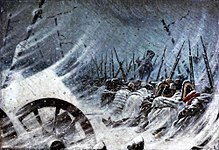 ↑ Bogdanovich, "History of Patriotic War 1812", Spt., 1859–1860, Appendix, pp. 492–503. ↑ 8.0 8.1 Caulaincourt 2005, p. 9. ↑ Caulaincourt 2005, p. 77, "Before a month is out we shall be in Moscow. In six weeks we shall have peace.". ↑ Caulaincourt 2005, p. 85, "Everyone was taken aback, the Emperor as well as his men – though he affected to turn the novel method of warfare into a matter of ridicule.". ↑ Riehn 1991, p. 236. หน้านี้แก้ไขล่าสุดเมื่อวันที่ 13 ธันวาคม 2561 เวลา 17:05 น.